Perios live in the world called Perioland. They are some of the most unique creatures in the universe. Perios also exist on Earth, throughout our solar system and in all the known galaxies. Only about 100 Perios are now known to exist, and every piece of matter living or non-living has one or more Perios inside it. Humans have about 60 different Perios inside their bodies; but only 6 make up 99% of each person. Perios take all kinds of shapes and sizes, and depending on how hot it is or their mood, they can change forms from runner to swimmer to vapor. All Perios have special powers which can be used to help or harm other Perios. Perios can also make teams or pacts with other Perios. When they do this, they can become even more powerful. The Perios in pacts are called Compos or Molqs. Some Perios are very steady and calm. Other Perios are always energetic and excited. These Perios can’t keep still and will try to get into pacts with any other Perio they meet. For example, Fhlo and its twin Chlo, are two of the most aggressive Perios and are always trying to make pacts with other Perios. By the way, Perios can easily transform to and from human’s Earth and our solar system. 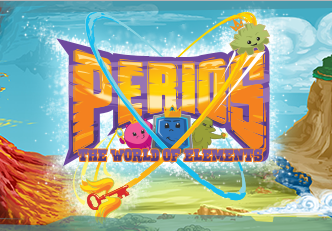 The story of Perios and the world of Perioland is complex and exciting! Have fun exploring!